P&O Cruises / We / Our / Us means Carnival plc. You means you and all guests in your booking. You are entering into this contract with Carnival plc trading as P&O Cruises Australia (P&O Cruises), ARBN 107 998 443. These and Your Booking Confirmation are the Terms and Conditions under which You book Your cruise holiday and travel on any P&O Cruises product We sell You. Once We have received the first payment towards Your cruise holiday, a legally binding agreement on these Booking and Travel Conditions becomes effective between all guests on Your booking(s) and Us. By making a payment, You represent that You accept and have authority from all guests (or their parent/ legal guardian) on Your booking(s) to accept on their behalf, our Booking and Travel Conditions. Parents/legal guardians accept the Booking and Travel Conditions on behalf of their children. It is important that You and all guests in Your booking read them carefully and understand them. Certain laws such as the Competition and Consumer Act 2010 (Cth) and any applicable state based consumer legislation (from here known as ‘Consumer Laws’), are in place for Your protection. They are designed to ensure our services are provided with due care and skill and are reasonably fit for a cruise holiday. These Booking and Travel Conditions do not alter any protection given to You by Consumer Laws. Many factors may affect Our ability to provide any particular itinerary. These include weather, mechanical difficulties, civil unrest or other unforeseen circumstances. We agree to use reasonable endeavours to provide a cruise in accordance with our published schedules and itineraries. However, We do not guarantee itineraries and they do not form part of Your contract with Us. If We are unable to operate in accordance with Our published itinerary, We may in some circumstances offer You assistance or compensation in accordance with clause 12. 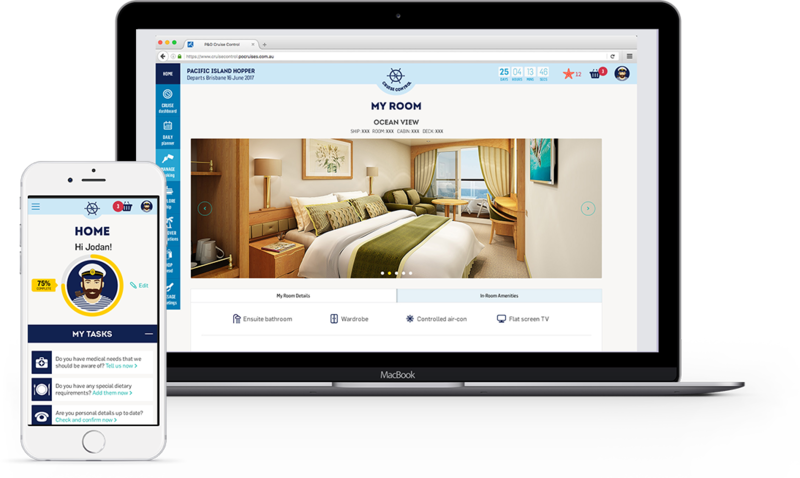 Each room can accommodate between one (1) and four (4) guests, with the exception of Pacific Adventure and Pacific Explorer which can accommodate up to five (5) guests, depending on the room configuration. Each room booked will be assigned a unique booking reference. A single traveller supplement applies to guests occupying a room alone. This will be outlined to You before You book with Your Travel Agent, online or through our Customer Service & Sales team. If You decide to make Your P&O Cruises booking through a registered Travel Agent, any amendments or enquiries on the booking will need to be made by Your Travel Agent. We reserve our discretion to refuse to accept a booking request from any guest or group for any reason, acting reasonably. Your fare is determined by the fare type, the number of guests in Your room, its location on the ship, the amenities offered, port charges, taxes, fees and port expenses (which are all subject to change), and any applicable airfares including taxes and fees. Child fares, where available, only apply when children are the third (3rd) or fourth (4th) guest in a room and are aged under 13 years. When you holiday with P&O Cruises you can choose to purchase a ‘Value Plus’, ‘Value’ or ‘Go’ fares. Guests who purchase a ‘Value Plus’ or ‘Value’ fare enjoy more flexible payment and cancellation conditions, as outlined in the ‘Payments’ and ‘Refunds Policies’ in clauses 7 & 11. Please specify at the time of booking which fare type you would like to purchase. The cruise fare includes onboard accommodation, main meals at most onboard restaurants (additional fees may apply to some menu items), entertainment and some activities onboard, gym and some fitness classes, as well as taxes, fees and port expenses. Additional charges may apply to some entertainment and activities, and main meals at onboard specialty restaurants. A number of optional extras are also available that are not included in the cruise fare including drink purchases, some onboard activities and entertainment, shore tours, shopping, wifi internet, laundry services, day spa services, fitness classes and additional dining options. In the event that a displayed price is incorrect, subject to any requirements under the Consumer Laws, We may retract the price and /or withdraw the product from sale and refund any payments made at the incorrect price. Sometimes We will release promotional fares. These can be offered and withdrawn at any time. If after booking You decide to change to one of these promotional fares, You may need to cancel Your existing booking and our Refunds Policy outlined in clause 11 will then apply. Onboard credit (OBC), which may also be referred to as Onboard Spending Money, may sometimes be offered as part of a promotional campaign (Promotional OBC) or it can be pre-purchased (Purchased OBC). Onboard credit is a monetary amount in Australian dollars which is applied to Your onboard account to be used for onboard purchases, excluding casino credit and medical expenses. Any unused portion of Promotional OBC will expire at the end of Your cruise and is not redeemable for cash at any time. Any Purchased OBC will be refunded at the end of the cruise if not used. All types of onboard credit are not transferable between any cruises, including back-to-back cruises. Your booking is not secure until an initial deposit in cleared funds is received by Us. If Your deposit as indicated on Your Booking Confirmation is not received within three (3) working days from the date that You make the booking, Your booking will be cancelled automatically by our system. For bookings made 75 days or less to departure, payment of the full cruise fare is due at the time of booking. Please ensure you check the payment conditions, including the deposit requirements, at the time of booking as some promotional fares may have specific payment conditions that may differ from those listed above. Some promotional fares may also require full payment at the time of booking. Your deposit and final payment due dates will be indicated on your booking confirmation. If we have not received your deposit or final payment by the due date, the booking will be cancelled automatically and our Refund Policy will apply in accordance with clause 11. When booking directly with P&O Cruises, service fees apply to payments made by credit cards or by PayPal. Service fees for credit cards, per transaction, are 1.1% for Visa and MasterCard and 2.3% for American Express. For PayPal transactions, a 1% service fee applies. There is no service fee for debit card or BPAY payments. Service fees are subject to change and will be advised at the time of payment. Once you have made your booking, please check your Booking Confirmation, ‘Cruise Control’, or with your travel agent to ensure the details are correct. Any name change to P&O Cruise Air bookings will require the air to be cancelled and rebooked, and applicable charges will apply as per the P&O Cruise Air Terms and Conditions. One original guest from the booking must always remain in the cabin. If all original guests cancel / are replaced, the booking will be subject to the Refund Policy at clause 11. If the cancelling guest was the only person that qualified the booking for a promotional fare (eg: past guestfare), additional and remaining guests will no longer be entitled to the promotional fare. The booking will revert to a different fare and the remaining guests will need to pay the difference in cost, if any. New guests added to bookings, and new bookings made within 48 hours of departure will be asked for passport information at the time of booking for security clearance. Please note, we are unable to accept new bookings or new guests on existing bookings after 5pm (Sydney time) on the day prior to departure. On occasion, We may offer reduced cost upgrades meaning that You may be offered a higher grade room at a discounted rate. The opportunity of an upgrade is never guaranteed and will always be at our discretion. We may also upgrade You without consultation to a higher room grade at no extra charge. The higher grade room could be in any part of the ship (forward, mid ship or aft) and could also be on a lower deck. If You have chosen Your booked room for a particular reason or You are travelling as a group and do not want to be considered for an upgrade, please let Your Travel Agent or our Customer Sales & Service team know at the time of booking. If You receive an automatic upgrade, please note that it is not possible to return to Your original booked room. Even if You request not to be upgraded, Your room can still be changed for operational reasons, including when the number of people booked in the room is less than the number of beds in the room (for example, 2 people booked in a quad room) or if You have selected a wheelchair accessible room and do not require one. In addition, when a booking is made and a specific room number is not selected (known as a ‘Guarantee’), the room will be allocated at our discretion in the grade booked, or a higher priced grade, at a later date. When booking on a “Go” fare, you will be booked into a room grade under a ‘Guarantee’. *Unless otherwise stated, the Refund Amount is determined by reference to the Total Fare (including taxes, fees and port expenses) , less any third party charges for which P&O are liable e.g. onshore activity cancellation charges. Any Restricted P&O CruiseAir booked will be charged 100% of the total airfare paid as a cancellation fee. Any Flexible P&O CruiseAir booked will be charged 100% of the total airfare paid as a cancellation fee if cancelled 44 days or less prior to the flight departure. For Air cancellation fees, please refer to the specific P&O CruiseAir Terms and Conditions before the cruise departure date. Please note, your Travel Agent and promotional fares may have different cancellation and refund terms. Please ensure You check these at the time of booking. Credit / debit cards – refunds will be issued back to the card/s that was used to make payment. BPAY – refunds will be issued via cheque. PayPal – If the refund date is 365 days or less since the original payment was made, the refund will be process back to the PayPal account. If it is more than 365 days, the refund will be processed via cheque. For cheque refunds, please ensure your correct postal address has been provided in your booking. Cheque refunds may take up to 20 business days. For bookings made through a travel agent, any refunds will be issued back to the travel agent. In addition, We may charter all or part of the ship, or remove the ship from service where this becomes necessary. We may change the itinerary, ship or cancel the cruise due to operational or commercial requirements. We will notify You of these changes as soon as We can. If We are forced to cancel the cruise for any reason prior to departure We will provide a full refund. Since Your itinerary is not guaranteed, please do not make any important arrangements or meetings based on the proposed itinerary. We strongly recommend You purchase appropriate international travel insurance at the time You pay Your deposit. As Australian Medicare and New Zealand Accident Compensation Corporation do not cover Your travel onboard, it is important that international travel insurance is purchased for all voyages (including domestic Australian itineraries which do not visit international ports). If You do not purchase international travel insurance You may not be able to recover any charges, medical costs, repatriation and other expenses that may be incurred if things do not go according to plan. Guests who are pregnant at the commencement of their cruise are required to supply a doctor’s letter confirming they are fit to travel, including the estimated due date, prior to embarkation. We are unable to accept any guests who will have entered their 24th week or later at any time during the cruise. For the safety and enjoyment of all onboard, there are limits on the number of children that can be carried within different age groups. The age of the guest on the day they board the cruise, is the age We use for the entire holiday. We will advise You at the time of booking whether We are able to accept bookings for children on the cruise You have chosen. For safety reasons, there needs to be at least one guest 18 years or older in each room. However, to accommodate families cruising together, children may occupy a separate room to their parent/legal guardian, including an inter-connecting room, providing one child is 16 years or over. Subject to applicable laws, for cruises departing from an Australian port between 1 November and 7 January, any guest under 19 years of age on the day they board the cruise, must travel in the same room as a responsible adult 19 years or older. In addition, from 8 January to 31 January, there is a limit on the number of guests under 19 years of age who can travel unaccompanied. Once the limit is reached, a responsible adult 19 years or older must travel in the same room. We can advise You at the time of booking whether the limit applies to Your booking. P&O Cruises can waive the responsible adult requirement at our discretion. Any requests for review of a waiver application decision can be made by emailing feedback@pocruises.com.au. The responsible adult is accountable for guests under 19 years of age in their room for the duration of the cruise, and the ‘Travel Restrictions and Rights of the Captain’ under clause 28 will be applied to anyone who displays disruptive behaviour. Parents/Legal guardians are responsible for children at all times, including when participating in Kids Club activities. If a child displays dangerous or disruptive behaviour, the ‘Travel Restrictions and Rights of the Captain’ under clause 28 will be applied to both parent/legal guardian and child. Some public lounges and onboard entertainment are designated as ‘adults only’. Parents/Legal guardians are responsible for ensuring that children under the age of 18 do not attend these restricted areas. Children’s access to pools and spas may be restricted and children will not be permitted to use any pools and spas marked for adult only use. Children must be toilet trained and under their parent’s/guardian’s supervision in order to use onboard pools, spas, waterpark and waterslides. Children wearing nappies will not be permitted to enter onboard pools, spas, waterpark and waterslides. Prams and strollers must be collapsible and capable of being stored in Your cabin. You acknowledge that if You are travelling with a child of whom You are not the parent or legal guardian, You are required to notify us and complete the ‘Consent Form for Minors Travelling with a Responsible Adult’ executed by the child’s parent or legal guardian. You must carry this form with You at all times during Your cruise. You may be asked to make decisions relating to matters such as that child’s safety, health and dietary requirements, medical treatment and decisions relating to disciplinary matters. Children under two (2) years of age are welcome to use the Kids Club facilities under the direct supervision of their parent/legal guardian. To attend the Kids Clubs without a parent/legal guardian, children need to be two (2) years of age or over. Use of Kids Clubs requires daily registration and entry is on a first-come-first-served basis as places are limited. Group child minding for children 2-12 years is available between 10.30pm and 1am only, for a fee. When booking a cruise visiting an international port, You are responsible to ensure You have all necessary visas, vaccinations and travel documents, including a passport that is valid for the minimum duration required based on the countries You are visiting. Your passport must be valid for a minimum of six months beyond the date of Your cruise return and have sufficient blank pages for entry and exit stamps and visas. Without the necessary passport, visas and/or vaccinations, local authorities may deny You boarding, prevent You from going ashore, issue a fine or deny the ship entry into the port. It is Your responsibility to ensure You have all the necessary documentation which permits You to travel, including visas for ports at which You do not intend to disembark. We will not provide You with a refund or reimbursement for any expenses or losses incurred as a result of Your failure to comply with these requirements. In addition, travel on a Round Trip Cruise from Australia will not be recognised by Australian Immigration to have left Australia and therefore the cruise cannot be used to revalidate an Australian visa. For domestic cruises departing an Australian port that do not visit an international port, and for domestic cruises departing a New Zealand port that do not visit an international port, a valid passport or government issued photo identification is required. Accepted forms of government issued photo identification includes drivers licences, proof of age cards (Queensland ‘Adult Proof of Age Card’ will be accepted, however the older version of Queensland ‘Card 18+’ will not be accepted) and Government ID cards. For Australian domestic cruises, a current Medicare card can be used for guests under 18 years of age. For New Zealand domestic cruises, an original or certified copy of the child’s birth certificate or a school pass with photo will be accepted for guests under 18 years of age. To ensure a safe and enjoyable holiday for all our guests items which may pose a risk to the safety of guests and crew are not allowed to be brought onboard our ships including: Irons, kettles, coffee machines, baby bottle warmers, candles, heating devices, illegal drugs, illicit substances, flammable liquids, weapons (including knives of any kind), hoverboards (Flyboards or similar devices),remote control devices of any kind, such as drones, and power boards with surge protection devices. In addition certain electrical items and personal grooming devices, such as power boards (without surge protection devices), laptops, phone and camera charges, , hair dryers and straighteners, curling irons and shavers may be allowed onboard if they are deemed to be in a safe and proper working condition, and used with proper caution. However, if such devices are deemed to pose a hazard, they will be confiscated and available for collection at the end of the cruise. All luggage, including hand and check-in, will be x-rayed at embarkation. In addition, it may be necessary for our staff and other parties, such as port and government agencies, to search You and Your luggage. You agree to allow such searches. Any prohibited items or items which may pose a quarantine or safety risk found in hand or checked in luggage will be confiscated and, if appropriate, will be available for collection at the end of the cruise. If the confiscated item is not collected at the end of the cruise, You must contact us within three (3) days of disembarking to claim the item if Your item is appropriate to be returned. If You do not contact us within this time Your item will be destroyed. We can deny boarding or disembark any person in possession of any weapons or illicit substances. We may also hand these items over to law enforcement agencies. All P&O Cruises’ ships operate on a ‘cashless’ system. When you check in, you will be asked to present a credit or debit card (Visa, MasterCard or American Express) which will be associated with your onboard “Cruise card”. The Cruise Card is what you will use onboard for all onboard purchases, which are charged in Australian Dollars. As an alternative to registering a credit or debit card, you can add funds to your onboard account at the self service cash kiosks onboard. The self service kiosks allow you to top up your onboard account free of charge using cash or Australian Eftpos (cheque or savings accounts only) with an Australian issued bank card. Non Australian issued bank cards cannot be used in the self service kiosk, but can usually be used in the ATMs onboard to withdraw Australian dollar currency. ATM fees apply. If you choose to register a credit or debit card (Visa, MasterCard or American Express) we will settle the outstanding balance on your onboard account to your credit or debit card at the end of each day. The card registered must have the name of the guest printed on the card and this must match the name of the guest’s photo ID used to embark the ship. Service fees apply to all onboard credit card transactions. The service fee for Visa and Mastercard credit card transactions is 1.1%. For American Express the service fee is 2.3%. There is no fee for Visa & MasterCard debit card transactions, or pre-paid cash passport Visa & MasterCard transactions. Service fees are subject to change and will be advised onboard. Pre-paid cash passport Visa & MasterCard travel products can also be registered to your onboard account as long as the card holders name is printed on the card and matches the name of the guest using the card. Travellers cheques are not accepted onboard. If you live outside of Australia please consider registering a prepaid cash passport Visa Card & MasterCard travel product to avoid currency conversion and international processing fees that may be charged by your bank. Please be aware that once you get onboard, even if you have not registered your credit or debit card at check in or added any funds to your onboard account, your Cruise Card authorises purchases onboard up to a maximum of AU$100, which will appear on your onboard account as an amount owing to Us. P&O Cruises are committed to the responsible service of alcohol. There may be times when We consider it appropriate to refuse the service of alcohol to a guest for any reason. Guests must be 18 years or over to purchase or consume alcohol, or gamble onboard. Government issued photo identification may be requested (Queensland ‘Adult Proof of Age Card’ will be accepted, however the older version of Queensland ‘Card 18+’ will not be accepted). As part of our commitment to the responsible service of alcohol and to ensure the safety and security of guests and crew, guests are prohibited from bringing alcoholic beverages onboard. In addition, some other beverage items are also prohibited from being brought onboard. For more details please refer to the Prohibited items clause (clause 20). As part of our Premium/The Lot drinks packages,, all Alcoholic beverages are limited to 15 beverages per 24-hour period (6am to 6am). Alcoholic beverages requested above this limit are subject to P&O’s Responsible Service of Alcohol (RSA) Policy and charged at regular menu prices.Non-alcoholic beverages have no daily limit. Smoking is not permitted indoors on any of our ships. This includes in guest rooms and on private balconies. For those who smoke, there are designated outdoor areas where smoking is permitted and this information will be communicated to You onboard. Electronic cigarettes can only be used in the designated smoking areas onboard. Please make sure that all valuable and important items, such as jewellery, medicines, fragile items, and camera/computer/electrical equipment are carried in Your hand luggage and not packed in Your main luggage/suitcase or left unsecured in Your room or elsewhere onboard ship. Once onboard, all valuables and important items should be stored in Your in-room safe. In the event You lose any items onboard, please notify Reception immediately. If You have already disembarked please contact our Guest Relations team. Due to hygiene reasons, any unclaimed clothing items will be destroyed at the end of the cruise. All other items not claimed within 3 weeks of the cruise return will be donated to charity or destroyed. Where Consumer Laws and other laws permit us to exclude our liability, We will not be liable for loss of, or damage to, any luggage or other belongings, unless caused by our proven negligence or failure to provide services with due care and skill or that are reasonably fit for purpose. If a guest has a condition that We decide may seriously affect the enjoyment, health or safety of themselves or any other person onboard, We can refuse or cancel a booking. Such decisions will be made giving reasonable consideration to Your circumstances and We will advise You of our decision as soon as possible. Where Your booking is cancelled You may be entitled to a refund. Guests with restricted or limited mobility, and those with medical conditions must be self-sufficient or travel with a carer or someone who can assist with day-to-day activities. Our crew and medical staff are unable to act as personal carers. Guests who are bringing a wheelchair or mobility aid onboard must advise Us at the time of booking. You must provide your own wheelchair or mobility aid and must ensure it can be stored inside Your cabin. Limited areas of the ship may not be wheelchair accessible. Please note that some ports can only be accessed using the ship’s tenders. Tender boats and tender ports are generally not accessible to guests who use a wheelchair or with significant mobility impairments. Each ship has a medical centre that is staffed by qualified, licensed doctors and nurses, who, in addition to routine clinic hours, are available 24 hours a day in the event of an emergency. All of our medical centres are well equipped to handle most medical conditions and are accredited to international healthcare quality standards. All cruises on our ships are outside the scope of Australian Medicare, New Zealand Accident Compensation Corporation and private health insurance. Consultations, treatments and medication are charged at private rates and must be paid by You and claimed through Your international travel insurance. All of our medical centres are only for medical needs arising onboard and cannot cater for treatments that You know You will require while on holiday. While We specialise in cruising holidays, You may choose to book other services through us such as flights and shore tours. We can assist You in making these arrangements; however, We act only as a booking agent. The service providers are solely responsible for the information and service offered and their conditions will apply. Where possible, We will assist in addressing any concerns You may have with these service providers. In the event that You go ashore You do so at Your own risk. You are responsible for adhering to the local laws, regulations and customs. We take no responsibility for any injury or loss that occurs while You are are not onboard the ship. You are responsible for ensuring that no travel restrictions apply to you. If police or any other authority in any jurisdiction notify us of, or We otherwise become aware of, any matter that reasonably causes us to believe Your presence onboard presents a risk to Your own health or safety or the health or safety of other guests and crew, we, or the Captain, may deny You boarding and may refuse or cancel any bookings from You. If You are required, or choose, to leave the cruise for any reason (unless caused by our proven negligence or failure to provide services with due care and skill and that are reasonably fit for purpose), We are not responsible for any expenses, including Your return home. This also applies if You do not return to the ship in time for sailing after a port visit. If We assist with any costs, You will be required to reimburse us. In addition, You will not be entitled to any refunds. It is important to be aware that it will not always be possible to leave a cruise early, even when on an Australian domestic itinerary. Some Australian ports have strict border and quarantine restrictions which prevent cruise ship guests from discontinuing the cruise in that port, even if they are an Australian passport holder. Many international ports also have strict border restrictions and visa requirements. P&O Cruises is committed to supporting communities in the destinations We visit. As part of our P&O Pacific Partnership Program a $1 donation will be automatically added to the onboard folio of each guest aged 18 years or over. The donation will be used towards community based initiatives in the destinations We visit. This is an optional donation and You may remove it from Your account at the Reception Desk before You disembark. Visit the P&O Cruises website for more information on our latest Pacific Partnership Initiatives. Recreational Services has the meaning set out in section 139A(2) of the CCA. if the provision or part of it cannot effectively be read down, that provision or part of it will be deemed to be void and severable and the remaining provisions of these Booking and Travel Conditions will not in any way be affected or impaired and will continue notwithstanding that illegality, invalidity or unenforceability. This contract is governed by the laws in force in New South Wales. You agree that any action You bring against us will be brought in Australia and will be subject to New South Wales law. If You have a claim against us, You agree only to bring an action against us and not any of our related bodies corporate as defined in the Corporations Act 2001 (Cth). For the safety and security of our guests and crew, We use Closed Circuit Television (CCTV) to monitor and record public areas onboard all our ships. In addition, shipboard crew may use body mounted cameras for security purposes. This footage and any accompanying audio recording is confidential and is not available for viewing, unless required or permitted by law. We are not responsible for any consequences arising from the viewing or other use of this footage.